"Book Bus make the whole experience work brilliantly." If you are aged between 18-75, have a passion for reading, are happy to mentor children and are willing to take the journey of a lifetime – we would love to hear from you. You can volunteer for as little as 14 days or for up to one month. The choice is yours. UNICEF estimate that 30% of boys and 40% of girls leave school in Zambia unable to read. A lack of materials and class sizes of 80 or more remain a constant obstacle to learning. Teachers do not have the time or opportunity to help with individual and smaller group learning. 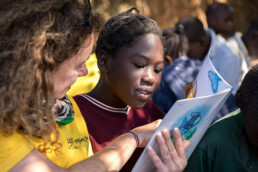 By becoming a volunteer reading assistant, you can provide the kind of dedicated support that can make all the difference as you work with primary school children supporting the on-going work of our Zambian Book Bus literacy team. 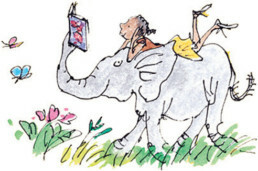 The Book Bus volunteer project in 2019 will be working in Livingstone from Monday 1st July to 6th September in local reading clubs and throughout the holiday period. As a volunteer you’ll be working with small groups of children in reading support programmes in and around Livingstone. You’ll also help run reading workshops in the local libraries. You do not need any special teaching skills or experience. If you can read, listen and engage with activities you are who we are looking for.